Christmas is almost here and we’ve got the best lighting ideas for your home decor. Elevate your Christmas decor with these mid-century modern lamps and enjoy the best time of the year! Due to its delicate and curved forms, Norah wall lamp has a vintage style that will transmit a sense of elegance and sophistication in every single space. This decorative wall light consists of five fixed arms made of brass with nickel plated and glossy black finishes. The wall lamp bulb holders are made in aluminum with a matte black finish. With five bulbs, this interior wall sconce includes E14 Bulbs (E12 for USA, not included). You can customize Norah with any RAL color of your choosing, in order to adapt this interior wall light to every room in your mid-century modern design. Going as high as 15.7 inches, Norah wall lamp will sit beautifully next to a piece of art in your living room decor. Strict northern design rules meets a southern taste. Characterized by the rhythmic composition of its elements, minimalist shapes and clean lines, Ike floor lamp is the result of a collaboration between a Dutch designer and DelightFULL’s designers team. Light up your nordic style living room, bedroom or office with this 70” minimalist floor lamp. With three adjustable lamp shades with glossy black and gold plated finishes, this Scandinavian floor lamp can light multiple areas, making it the perfect addition to your mid-century modern interior. All in all, Ike is an elegant brass floor lamp full of refinement and modernity, providing a warm and inviting tone to any room. Botti floor lamp was inspired by the jazz musician of Chris Botti. 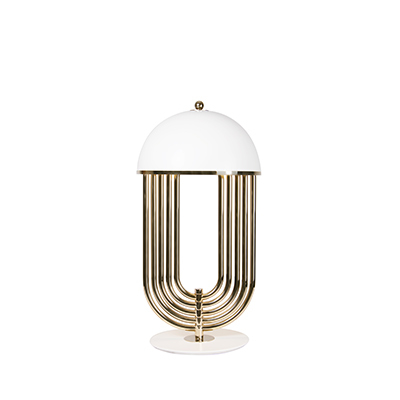 The mid-century floor lamp is handmade in brass with a gold plated finish that reminds of a real trumpet due to the its unique shape. With an aluminum base, this modern floor light can be customized in marble, giving an even more luxurious design to your mid-century modern interior. This brass floor lamp has eight spotlights which offer a soft lighting, and goes as tall as 70,9 inches. 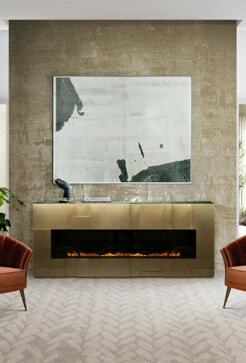 Botti art deco floor lamp showcases a high-quality craftsmanship, that will definitely make a statement in your sophisticated classic living room design or mid-century hotel lobby. 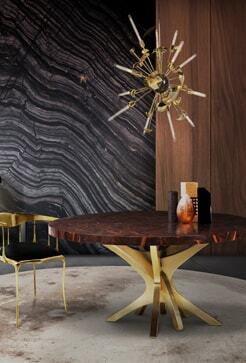 Botti contributes a jazzy and mid-century vibe as does the gold plated and white glossy finishes. What’s HOT On Pinterest: The Best Lighting Design Ideas!